Earlier, I have posted a tip to get PC maintenance utility Advanced WindowsCare Professional for free, Today I will show you a similar tip to get fully registered version of the popular software System Mechanic for free the legal way. Most of you don't need introduction to this software, however if you have never heard about System Mechanic the software lets you perform complete tuneup of your Windows PC using a set of powerful tools to speed up, optimize, repair and maintain your PC to the optimum performance level. * Faster disk defrag: defragment drives up to 300-percent faster than previous versions of System Mechanic, and up to ten times faster than Windows built-in defragmenter. * Fix Windows security holes: new security optimizer wizard finds dangerous security flaws in Windows and repairs them automatically. * One-click power tools: Easily perform important system maintenance with just one click. 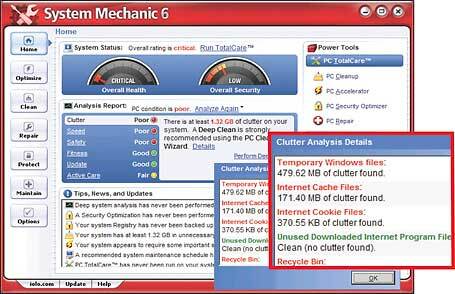 Repair, accelerate, clean, and secure your PC with one click using the System Mechanic comprehensive new Power Tools. * Full service in one pass with PC TotalCare: Repair, accelerate, clean, and secure your PC with one click with the System Mechanic PC TotalCare tool. * Repair hard-drive problems: New Drive Medic finds and fixes hard drive problems before they can cause data loss or system failure. * Full disaster recovery: Recover from even the worst system crashes with Drive Medic Disaster Recovery. Rescue PCs that won’t start and revive hard drives that were reformatted, repartitioned, or worse. * PC accelerator wizard: the proprietary System Mechanic PC optimization techniques increase system responsiveness, decrease boot times, and speed up Internet and download rates by up to 300 percent. * Advanced process manager: Take a look under the hood with the new advanced process manager and see what’s running--visibly or otherwise. Automatically block dangerous items from starting again. Great for troubleshooting stubborn problems. * Advanced startup manager: Review thorough information about the more than 20 different places where programs may hide to automatically startup with Windows. Automatically find and eliminate dangerous and unnecessary programs. Even permanently block programs from starting again through integration with System Mechanic Startup Guard technology. * Decrease boot time with startup optimizer: find dangerous and unnecessary startup items and remove or delay them so that Windows starts up faster, making you more productive instead of waiting for unnecessary programs to load. * Enhanced registry optimization: newly augmented optimization technology finds and fixes even more registry problems that would cripple your system. * Improved spyware protection: Spython integrates new proactive "always on" protection from dangerous spyware, malware, adware, and unauthorized surveillance software. * New comprehensive system-inspector tool: Get an ultra-detailed report of everything in your PC, from installed software, to attached peripherals, to core system hardware, and everything in between. Visit this special promo link. Follow on-screen instructions and complete the signup process. Install and use your own legal registration license key to unlock full version. WOWWWIES!! thanks alot! :) i definately need this. although i do have tons of utility programs, having one this good definately helps. The link http://www.iolo.com/ads/vnu/sm6promo.aspx is 404 and blank. I just checked its working fine, You must disable any ad-blocker/firewall etc. to use the url as the URL contains word "/ads/" which is blocked by adblockers and firewalls. Hey thanks much I rec'd 2 separate reg codes both worked fine! You saved me some big coin. Link's working fine and it's truly for $0, no credit card check!!!!! I clickt on the link and its showing $69.95 the link dont work no more??? The button below will direct you through the necessary steps to receive your free serial number and user ID which may be used to activate your product. ** Please note that no credit card number or payment is required. Can you PLEASE help me with version 9.5.9 registration key. If not available - pls send me a key for any older versions. For a limited time, buy System Mechanic and get 6 additional months FREE. Simply purchase here and we will add an extra 6 months FREE to your order for a total of 18 months. As always, your purchase is protected by our 30 Day, 100% Satisfaction Guarantee. Got PC problems? System mechanic is your solution! "System Mechanic 8 from iolo technologies does work as advertised and will keep your Windows machine "looking like new!" System Mechanic runs on 32-bit Windows Vista™, XP, and 2000.
i need activation key for the product. pl. send. Please email it to me at shebro@rambler.ru I really need it. Please sent me the registration code for SYSTEM MECHANIC 9.0. I'll be very thankful 4 your anticipations!!! hi, i´m from brazil, and i need the code for system mechanic 9.0..
activation code for system mechanic 9. Could you kindly send me system mechanic 9.5 activation serial number. Hi, I m from Turkey, could you kindly send me system mechanic 8.5.6 activation key. Hi, I m from kurdistan , could you kindly send me system mechanic 10.5 activation key. Please provide activation key for System Mechanic 10.5. Thanks. Could anyone send me the activation key for SM 10.8.2.2 please? Thank you. Hi, have you the activation key of iolo system mechanic 10.8.2.2 ? can you send me in my e-mail? Could anyone send me the activation key for iolo System Mechanic Pro 1.0.2.99 please? Thank you. Hi.. I updated my SM10 to SM 11.1.6.1.. But need to input an activation code to use full version..
Can anybody help with this key?? System mechanic 14.0.1 standard is out. Could you get me the license key for system 14, please? This is basically a referral link for which for which the website author gets paid!